Over the years, Thane is known as the twin city of Mumbai. 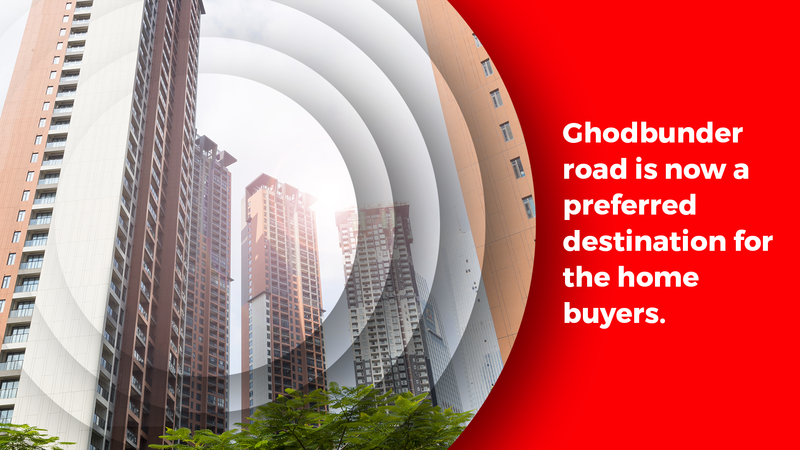 With the slew of robust infrastructure and transport linkages established, Ghodbunder Road in Thane has now evolved as a preferred destination of the discerning home buyer’s. From perceived as the affordable home market, at the turn of the millennium it was positioned as a mid-range housing option. Today with the increasing base of commercial hubs and planned connectivity compounded with the enhanced civic infrastructure it has evolved into the prime destination for luxury residential real estate in MMR. The decentralization of the business districts towards the north of the Island city, thriving IT sectors, growing interest from the BFSI segment, mushrooming of the organized Retail has a cumulative effect on the value proposition of Ghodbunder Road as a newly preferred micro market. Thane is the 16th most populated city in the country with a population of 18.9 lakh. As per 2011 census, Thane has experienced rapid urbanization during the past few decades. The population is expected to be 27.34 lakh in 2025, 34.99 lakh in 2035 and 39.45 lakh by 2045. With an increasing density of population, the city needs to gear up in terms of connectivity, transport linkages, and infrastructure. To meet the need for ever-increasing traffic congestion and population density, government authorities are looking at ways to enhance the linkages for Ghodbunder Road. As road and rail connectivity is fast becoming crowded, MMRDA has created planned connectivity which shall link up regions of Thane with SOBO and at the adjoining areas like Bhiwandi, Kalyan, Dombivali as also Vasai and Virar on the western line via metro. To create the city’s future-proof connectivity, MMRDA has planned a 29-km-long ring internal Metro corridor in Thane. Out of the total 29-km-long route, around 26-km will be elevated and the remaining 3-km stretch will be underground, stretched over 22 metro stations and 2 underground stations. It will connect the city’s interiors and provide faster and economical mode of transport to the city’s residents, especially those staying in the newly developing areas. An additional ring route metro is intended to handle the increasing vehicular density and ease traffic congestion. An estimate of how fast the city is expected to grow comes from the MMRC’s estimates of daily ridership of the Thane Ring Metro – around 5.76 lakh in 2025, expected to rise to around 8.72 lakh passengers by 2045. As an evolving global city, Thane is experiencing a comprehensive makeover, backed by a slew of infrastructure development and economic growth opportunities. From a time when it was seen as one of the ‘major’ real estate options for a home seeker, today it has reached the stage where it is considered one of the ‘first choices’ when looking out for a home. A clear winner when it comes to being the choice of aspiring home buyers, Ghodbunder road, Thane rightly tops the league in terms of residential, commercial and retail spaces – and it needs the ring Metro network, going into the future. The Detailed Project Report (DPR) for the Thane ring Metro line, which is estimated to cost around Rs 12,000 crore, is nearing completion. With these infrastructure projects making the city ‘future-perfect’, Thane tops the list of the high-end home seeker looking out for a global home. Premium and luxury home seekers can choose from different ‘Palatial Living’ options in Thane. “The options of high-end homes across different projects are set to enhance Thane’s status as not just a high-end real estate destination, but an Uber luxury destination for palatial homes,” concluded Dr. Niranjan Hiranandani.